Supporting the businesses that support your community. The Orion Area Chamber of Commerce has been a voice for the local business community since our founding in 1950. It is our mission to advance the general welfare and prosperity of the greater Orion area. Our Chamber is made up of business, educational, governmental and non-profit entities who serve the needs of our residents and member businesses. 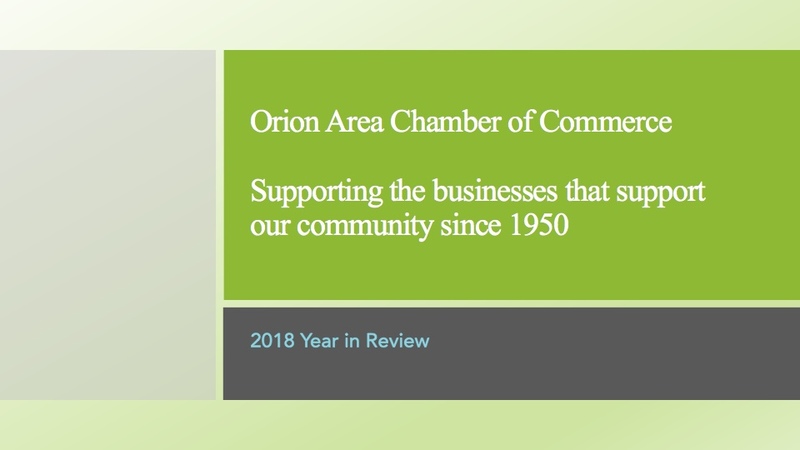 The Orion Area Chamber of Commerce is a valuable resource for businesses, providing leadership, advocacy, professional development and economic growth for businesses in and around the Orion area. The OACC is an effective and influential community partner. We work closely with and strive to be a strategic, trusted partner of Orion Township, the Village of Lake Orion, Oakland County and the State of Michigan. Our goal is to serve as the leaders of positive future growth for members’ businesses and the community. If you conduct business in or around Lake Orion or Orion Township, Michigan, the Orion Area Chamber of Commerce invites you to join our growing organization. The OACC provides networking opportunities, business education, company visibility and experienced resources to help your business grow and thrive in today's business climate. Our organization represents a diverse membership spanning a wide spectrum of specialties in manufacturing, services, governmental agencies and non-profit organizations. Our members bring a wealth of knowledge on a variety of topics! Web site photos are provided courtesy of Paula Kurzawa Photography and the Orion Area Chamber of Commerce.